Pacquiao Not Intimidated: Spence Doesn't Really Hit That Hard! 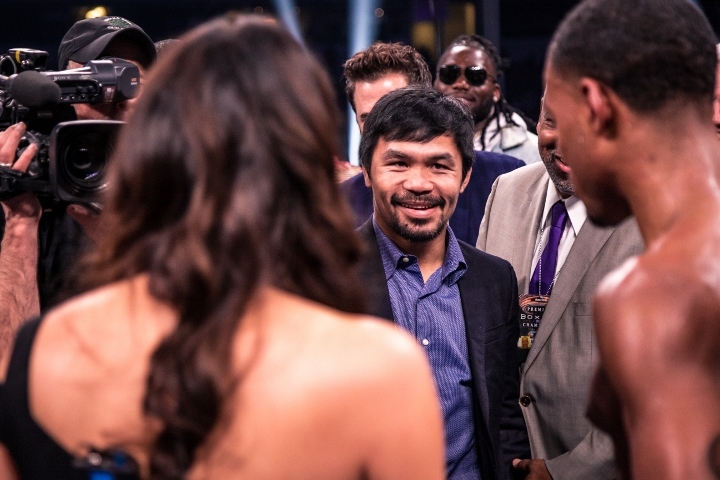 WBA "regular" welterweight Manny Pacquiao was not intimidated by what he saw this past weekend. Pacquiao traveled a long way from the Philippines, to sit ringside at AT&T Stadium in Arlington, Texas. "He doesn’t really hit that hard,” said Pacquiao to Nick Giongco of Tempo. "He is like Ledwaba,” said Pacquiao said. Pacquiao is now aligned with powerful adviser Al Haymon of Premier Boxing Champions. Pacquiao plans to sit down with Haymon to discuss the options on the table - for a potential July date. “I have to talk to Al Haymon first,” Pacquiao said. “I want it in July so that my work at the Senate won’t be affected." But based on the buildup during the night, and in the aftermath, it appears Spence may be guided in the direction of a unification fight with WBC world champion Shawn Porter - which in turn would leave the door open for Pacquiao and Thurman to collide in a battle of WBA champions. Welp...from the horses mouth. He wants no parts of Spence.